Immaculate Conception of the Blessed Virgin Mary - My Catholic Life! The Ark of the Covenant was a sumptuously adorned chest which housed the Jews’ most sacred objects: the tablets of the Ten Commandments, a pot of manna, and Aaron’s staff. Before its disappearance, the Ark was the centerpiece of the Holy of Holies, the mysterious chamber behind the curtain in Jerusalem’s high temple. Only the high priest dared to enter this sacred chamber. Mary is the Ark of the New Covenant. She is not a gold-encrusted chest filled with artifacts but the flesh and blood person who carried Jesus Christ inside of her. Today’s feast celebrates Mary’s own stainless conception, that remote preparation by which she became that vessel of honor where the living Word first sprang to life. God prepared Mary from her first instance for this great purpose—to be the perfect edifice to carry, birth, and mother the Son of God, to whom any tint of sin would be repugnant. Mary was conceived in the natural human way by her parents, Joachim and Anne. But God had a plan, and was eager to give Mary an utterly unique gift that could not wait until her childhood or adolescence to be unwrapped. The gift of the Immaculate Conception was given contemporaneously with Mary’s microscopic sparking to life. If we had the chance to choose our own mother, we would not select a selfish, disordered, mean, and sinful woman. We would lovingly accept such a mother but not deliberately choose her. God could choose His own mother, though, and so logically chose a perfect one. As the author of creation, He crafted a pristine soul incapable of sin or disorder. Alone among all creation, Mary reaped the spiritual rewards of her Son’s resurrection before its historical occurrence, saving her from death and bodily corruption, sin’s cruelest punishments. Mary was simply flooded with God’s grace in her very origins and never ceased to be united with Him after that. When she is just a fetus, a woman has as many eggs as she will ever have. The ovaries of a female fetus are saturated with eggs whose numbers will only decrease over time. So half of the genetic material necessary to form an embryo is latent and waiting inside of that embryo’s mother since the time the mother was herself in utero. The unbroken chain of human life is unfathomably beautiful. Grandmother, mother, and grandchild are, in a certain sense, together in every woman expecting a daughter. When Mary was conceived in the womb of Saint Anne, then, the DNA of Jesus of Nazareth was already present in the embryonic Mary. This is a biological fact, not a statement of faith. At the Annunciation, when Mary miraculously conceived Jesus by the power of the Holy Spirit, the force of that “Lord and Giver of Life”caused the Christ Child to first stir with humanity inside of the body where His genes had long been waiting. Everything new is experienced as a miracle—a new dawn, a new baby, a new house, a new marriage. The Immaculate Conception is celebrated with great solemnity around the world because it commemorates a pivotal moment. In Saint Anne, God was readying the fairest flower of Israel, her most modest daughter and humble rose, for Himself. Mary’s virtues of humility and obedience would straighten the path twisted by Eve’s sins of pride and disobedience. By God’s own choice, Mary alone would escape the grip of Adam’s sin. 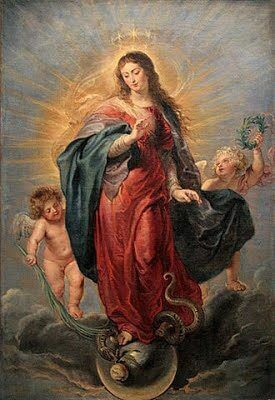 She would be the New Eve, that Spiritual Vessel, House of Gold, and Morning Star whose Immaculate Conception was the first flicker of a greater Light to come. Mary of the Immaculate Conception, may your purity, virtue, and obedience be a perennial model for all the faithful of the humble and narrow pathways which alone lead to God. Be at our side to encourage and inspire us as we try to be ever nearer to your Son Jesus.